Integra Investments announced that Doc B’s Fresh Kitchen inked a lease for 5,600 square feet at the 7.5-acre development. The restaurant, which also has a location in Tampa, joins Icebox Cafe, Starbucks, The Mediterranean Kitchen, Graziano’s Market and Angelo Elia Pizza Bar & Tapas, as well as retailers greenmonkey yoga, Barry’s Bootcamp, Cycle House and Lee Spa Nails. Doc B’s serves burgers, salads, sandwiches and seasonal entrees that include fried chicken and fish of the day, as well as craft beer, wine and liquor, according to a press release. The restaurant group, owned by Craig Bernstein, is expanding with additional plans for Fort Lauderdale, Fort Worth, Austin and Dallas. The restaurant’s Fort Lauderdale location at 500 North Federal Highway will open by the end of the year, according to the Comras Company. 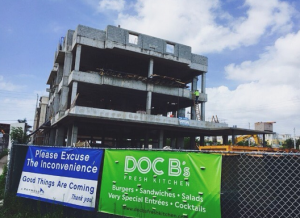 Doc B’s is in the midst of construction. Jeff Evans, Comras’ senior director of retail Leasing, represents the tenant exclusively in South Florida. The Aventura location, set to open in 2018, will feature a minimalist design and open space. Comras’ Jonathan Carter brokered that lease, according to a spokesperson. “The project’s customer base is perfectly aligned with our concept and we look forward to further expanding our footprint nationally,” Bernstein said in the release. In all, Aventura ParkSquare will have 55,000 square feet of retail space, a 131-unit residential tower, 100,000 square feet of Class A office space, a 45,000-square-foot wellness and medical center, and an Aloft Hotel that will is being developed by Norwich Partners. Integra broke ground on the project in April with a $100 million construction loan and expects to finish in 2017. Suffolk Construction is the general contractor.